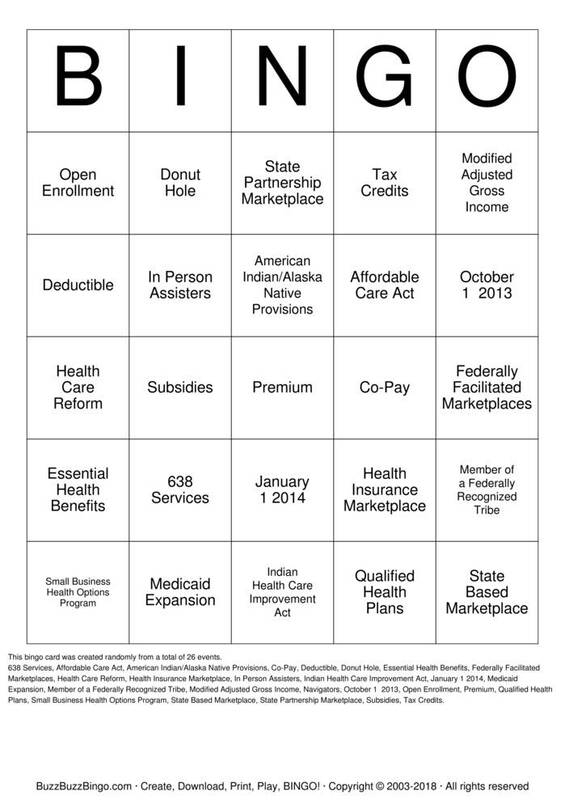 ACA BINGO Bingo Cards to Download, Print and Customize! Print 2 pages of ACA BINGO Bingo Cards for free. Download a PDF with 2 free pages of bingo cards plus instructions and a randomized call sheet. Play ACA BINGO bingo in a browser or customize the events, free space, etc. Purchase more randomly generated bingo card pages below. 638 Services, Affordable Care Act, American Indian/Alaska Native Provisions, Co-Pay, Deductible, Donut Hole, Essential Health Benefits, Federally Facilitated Marketplaces, Health Care Reform, Health Insurance Marketplace, In Person Assisters, Indian Health Care Improvement Act, January 1 2014, Medicaid Expansion, Member of a Federally Recognized Tribe, Modified Adjusted Gross Income, Navigators, October 1 2013, Open Enrollment, Premium, Qualified Health Plans, Small Business Health Options Program, State Based Marketplace, State Partnership Marketplace, Subsidies, Tax Credits.